The TV Special: Experience Christmas with Rick Steves in England, Norway, France, Italy, Germany, Austria, and Switzerland! 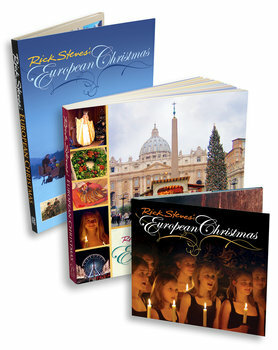 Available on DVD, you get the beautifully filmed, hour-long "Rick Steves' European Christmas" PBS-TV special — plus 45 minutes of content you won't find in the TV version, including full-length choir performances, Pope John Paul II's last midnight Christmas Mass, interview with the Christkind, Italian manger scenes (presepi), and a musical slide show of European Christmas images. The Book: In this full-color 240-page companion to Rick's TV special, Romans cook up eels, Salzburgers shoot off guns, Germans buy "prune people" at markets, Norwegian kids hope to win marzipan pigs, and Parisians ice-skate on the Eiffel Tower. With thoughtful insights, scores of colorful photos, and more than a dozen recipes, this book perfectly captures the spirit of the season. It's a delightful way to learn something new — and old — about Christmas. The Music CD: Includes 20 musical selections from the TV show, including special full-length performances by the Norwegian Girls Choir (Oslo), The Sixteen (London), the Bath Abbey Choir of Boys and Men, the Premiere Brass Quintet (Bath), the Wilhelm-Loehe School Choir (Nürnberg), the Nonsuch Singers (London), and Phonema (Beaune). It's the perfect soundtrack for your own holiday festivities this year!